You should have a look at beardie morphs. They have come a very long way. Hahahaha I don't think that is genetically possible, but if it where just think of how the baby's would look and what it could do. Kenan, very few people really attempt lizard hybrids (in breeding is not really the correct word). Chameleons and Bearded Dragons will never hybridize. The are too diffirent. The animals you intend to hybridize need to at least be of the same family (one genus of chameleon to another one type of monitor to another). I also think there will be no market for lizard hybrids so producing them won't be of much use. If you're looking for something unique and "crazy looking" you best bet would be some of the higher-end Leopard gecko morphs. And that's only the tip of the iceberg. There are some awesome morphs out there. Check out our Leopard Geckos section for more awesome morphs. westley wrote: Kenan, very few people really attempt lizard hybrids (in breeding is not really the correct word). I think he means inter-breeding inbreeding would be taking animals from the same parents. westley wrote: Chameleons and Bearded Dragons will never hybridize. The are too diffirent. The animals you intend to hybridize need to at least be of the same family (one genus of chameleon to another one type of monitor to another). I see that animals from the same genus, frequently interbreed. Not sure of same-family-different-genus examples. westley wrote: I also think there will be no market for lizard hybrids so producing them won't be of much use. Still people may do it out of curiosity. westley wrote: If you're looking for something unique and "crazy looking" you best bet would be some of the higher-end Leopard gecko morphs. ...And that's only the tip of the iceberg. There are some awesome morphs out there. 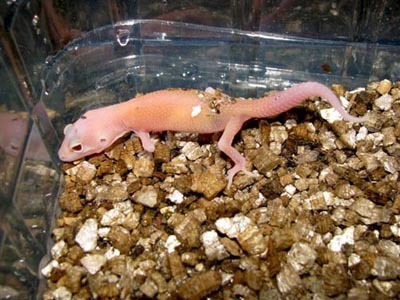 Check out our Leopard Geckos section for more awesome morphs. Don't like albinos. I prefer them the way God made them. Not to spark a debate uncutdiamonds but most morphs do occur naturally or at least have their origin in nature, just like albino people. I also like normals more (even though I keep morphs). Click this for a great website of scientific name translations! Do the hybrids have fertile off-spring? Actually, I've not heard of any infertile snake hybrids. Maybe someone else can shed some light on this? westley wrote: ...Actually, I've not heard of any infertile snake hybrids. The hybrids on species level and above of mammals usually are infertile. Think of donkey x horse or lion x tiger. I say usually, because there were exceptional cases were the hybrids were fertile and produced off-spring. Some crow species can interbred, but with less healthy offspring. It would indeed be interesting to know what has been observed with lizards and snakes. Yeah, I'm also interested to find out if there are infertile snake hybrids. Even the Woma x Ball Python hybrids are fertile, and to me, that is as far genetically apart as you can go within a family.